On the 1st (Sat), see the interesting displays at Rhythm! Discovery Center and then learn about winemaking at Hopwood Cellars Winery. To find other places to visit, ratings, reviews, and other tourist information, refer to the Indianapolis attractions website . Lancaster to Indianapolis is an approximately 7.5-hour combination of train and flight. You can also do a combination of train and flight; or drive. In June, daytime highs in Indianapolis are 82°F, while nighttime lows are 63°F. Cap off your sightseeing on the 2nd (Sun) early enough to go by car to Saint Louis. Take a break from the city and head to Johnson's Shut-ins State Park and Elephant Rocks State Park. Get a sense of the local culture at Cathedral Basilica of Saint Louis and City Museum. Explore Saint Louis' surroundings by going to Old Village Mercantile (in Caledonia), Sainte Genevieve Catholic Parish (in Sainte Genevieve) and Adam Puchta Winery (in Hermann). There's still lots to do: meet the residents at Saint Louis Zoo, identify plant and animal life at Sachs Butterfly House, steep yourself in history at Ulysses S. Grant National Historical Site, and see the interesting displays at Cardinals Hall of Fame and Museum. To see more things to do, other places to visit, maps, and tourist information, go to the Saint Louis trip itinerary tool . Drive from Indianapolis to Saint Louis in 4.5 hours. Alternatively, you can fly; or take a bus. The time zone difference moving from Eastern Standard Time (EST) to Central Standard Time (CST) is minus 1 hour. June in Saint Louis sees daily highs of 87°F and lows of 67°F at night. Cap off your sightseeing on the 6th (Thu) early enough to travel to San Diego. Kick off your visit on the 8th (Sat): take in the dramatic natural features at Point Loma. For ratings, other places to visit, traveler tips, and tourist information, go to the San Diego trip planning website . Traveling by flight from Saint Louis to San Diego takes 5.5 hours. Alternatively, you can drive; or take a bus. Due to the time zone difference, you'll gain 2 hours traveling from Saint Louis to San Diego. Expect little chillier weather when traveling from Saint Louis in June: highs in San Diego hover around 73°F, while lows dip to 64°F. Wrap up your sightseeing by early afternoon on the 8th (Sat) to allow time for travel to Grand Canyon National Park. Step out of the city life by going to Rim Trail and Bright Angel Trail. Your cultural itinerary includes sights like Kolb Studio and Yavapai Geology Museum. The adventure continues: explore the stunning scenery at Grand Canyon South Rim, take some stellar pictures from Mohave Point, tour the pleasant surroundings at North Kaibab Trail, and pause for some photo ops at Powell Point. For reviews and more tourist information, you can read our Grand Canyon National Park travel planning website . Traveling by combination of flight and bus from San Diego to Grand Canyon National Park takes 8 hours. Alternatively, you can drive; or do a combination of flight and shuttle. Due to the time zone difference, you'll lose 1 hour traveling from San Diego to Grand Canyon National Park. While traveling from San Diego, expect somewhat warmer days and cooler nights in Grand Canyon National Park, ranging from highs of 85°F to lows of 42°F. Wrap up your sightseeing on the 12th (Wed) to allow time to travel to Yosemite National Park. Get in touch with nature at Vernal Fall and Bridalveil Fall. You'll explore the less-touristy side of things at Mariposa Grove of Giant Sequoias and Yosemite Falls. 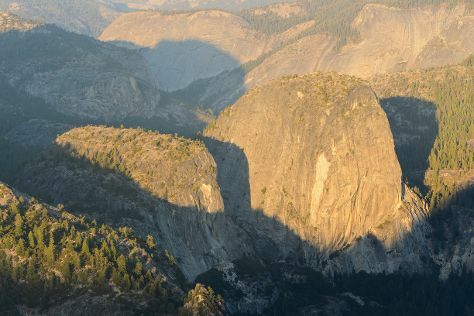 There's still lots to do: explore the striking landscape at Glacier Point, don't miss a visit to Olmsted Point, take in the awesome beauty at Cathedral Beach Picnic Area, and stroll through Tuolumne Meadows. For maps, reviews, ratings, and other tourist information, refer to the Yosemite National Park trip builder site . You can do a combination of bus and flight from Grand Canyon National Park to Yosemite National Park in 13 hours. Other options are to do a combination of shuttle and bus; or take a bus. The time zone changes from Mountain Standard Time (MST) to Pacific Standard Time (PST), which is usually a -1 hour difference. When traveling from Grand Canyon National Park in June, plan for little chillier days in Yosemite National Park, with highs around 79°F, while nights are about the same with lows around 43°F. Finish your sightseeing early on the 17th (Mon) so you can travel to Paso Robles. 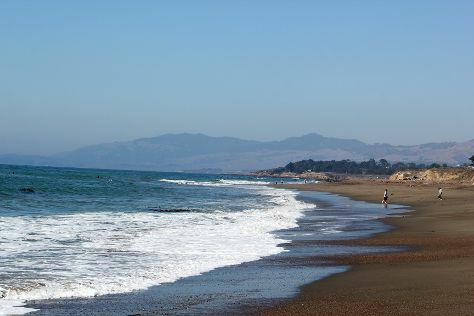 We've included these beaches for you: Moonstone Beach and William Randolph Hearst Memorial Beach. You'll discover tucked-away gems like Speed Boats Tours and Bob Jones City to Sea Bike Trail. Explore Paso Robles' surroundings by going to Ancient Peaks Winery (in Santa Margarita) and Hearst Ranch Winery (in San Simeon). There's much more to do: take in the history at Mission San Miguel Arcangel, learn about winemaking at Sculpterra Winery & Sculpture Garden, and see the interesting displays at Estrella Warbird Air Museum. For photos, where to stay, and more tourist information, read Paso Robles journey builder site . You can do a combination of car, flight, and bus from Yosemite National Park to Paso Robles in 10 hours. Traveling from Yosemite National Park in June, expect Paso Robles to be a bit warmer, temps between 93°F and 53°F. Cap off your sightseeing on the 20th (Thu) early enough to travel to Cannon Beach. Cannon Beach is a city in Clatsop County, Oregon, United States. Get some cultural insight at Tillamook County Pioneer Museum and Tillamook Air Museum. Kids will enjoy Cannon Beach and Haystack Rock. Step out of Cannon Beach to go to Rockaway Beach and see Rockaway Beach Wayside, which is approximately 38 minutes away. There's lots more to do: immerse yourself in nature at Ecola State Park, kick back and relax at Hug Point State Recreation Site, look for gifts at Bronze Coast Gallery, and brush up on your knowledge of spirits at Cannon Beach Distillery. To find photos, more things to do, maps, and more tourist information, read Cannon Beach itinerary website . Getting from Paso Robles to Cannon Beach by combination of train, flight, and bus takes about 11 hours. Other options: do a combination of bus and flight; or drive. When traveling from Paso Robles in June, plan for much colder days in Cannon Beach, with highs around 66°F, while nights are about the same with lows around 52°F. Wrap up your sightseeing on the 24th (Mon) early enough to travel to Rapid City. Get outdoors at Reptile Gardens and Yellow Mounds Overlook. Your cultural itinerary includes sights like Downtown Rapid City and The Museum @ Black Hills Institute. You'll find plenty of places to visit near Rapid City: Keystone (Mount Rushmore National Memorial & Breezy Point Picnic Area) and Loop Road (in Badlands National Park). There's much more to do: take in the awesome beauty at Black Hills, examine the collection at Museum of Geology, look for all kinds of wild species at Bear Country USA, and do a tasting at Firehouse Wine Cellars. To find traveler tips, reviews, photos, and other tourist information, refer to the Rapid City itinerary planner . Getting from Cannon Beach to Rapid City by combination of bus and flight takes about 9 hours. Other options: do a combination of bus, train, and flight; or drive. You'll lose 1 hour traveling from Cannon Beach to Rapid City due to the time zone difference. Expect a bit warmer weather when traveling from Cannon Beach in June: highs in Rapid City hover around 78°F, while lows dip to 57°F. On the 29th (Sat), you'll travel to Munising. Munising is a city on the southern shore of Lake Superior on the Upper Peninsula of the U.S. You'll explore the less-touristy side of things at Pictured Rocks National Lakeshore and Munising Falls. Escape the urban bustle at Miners Castle Rock and GarLyn Zoological Park. Explore Munising's surroundings by going to Sable Falls (in Grand Marais), Sand Point Lighthouse (in Escanaba) and Seney National Wildlife Refuge (in Seney). There's lots more to do: kick back and relax at Sand Point Beach, take in the dramatic scenery at Chapel Falls, explore the activities along Chapel Rock and Beach, and get engrossed in the history at Pictured Rocks Interpretive Center. For photos, where to stay, and more tourist information, read Munising itinerary builder site . Traveling by combination of flight and taxi from Rapid City to Munising takes 5.5 hours. Alternatively, you can drive; or do a combination of bus and car. You'll lose 2 hours traveling from Rapid City to Munising due to the time zone difference. Plan for slightly colder temperatures traveling from Rapid City in June, with highs in Munising at 68°F and lows at 49°F. Cap off your sightseeing on the 4th (Thu) early enough to travel back home.